The PUD treats and distributes 5 billion gallons of water a year and is the largest water processor in Whatcom County with an average use of 17 million gallons per day. It sells more water than any other PUD in the state by almost twice the amount. The PUD holds water rights of 53 million gallons per day. It operates 1 water system comprised of 2 river diversions, 2 treatment plants and 20 miles of pipeline. Pictured left is the Plant 1 Intake Station on the Nooksack River. The PUD provides industrial grade (non-potable) water to industrial and irrigation customers. 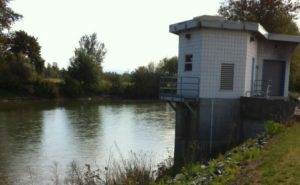 The two PUD treatment facilities draw water from the Nooksack River. The function of the plants is to provide primary treatment, which lowers turbidity levels before conveying the water to its customers. A minimal amount of chlorinating is done to prevent algae growth in the settling basins. Plant 1 is located downstream of the City of Ferndale. The maximum intake flow is 50 cubic feet (approximately 374 gallons) per second. Plant 2 is located upstream of Ferndale. The maximum intake flow is 28 cubic feet (approximately 209 gallons) per second. Pictured at left is the large red water transmission pipeline and view of Mt. Baker from the Plant 2 Facility. To help support the collective goal of ensuring a safe and reliable drinking water supply, the Washington State Department of Health oversees and enforces a Water Use Efficiency Program that water suppliers must fulfill. Fundamental elements include metering requirements, water use efficiency, distribution leakage standard, goal setting and performance reporting. Learn more about PUD #1’s Water Use Efficiency Program. 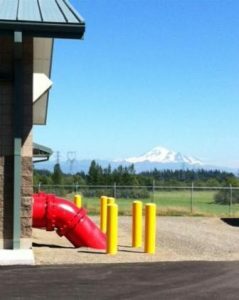 The PUD operates a second water system providing potable and fire protection water for a large industrial park north of Ferndale. Source water for this system is supplied by groundwater pumped from one well. The Consumer Confidence Report is prepared in accordance with Federal Safe Drinking Water Act requirements which describes the monitoring program and results associated with this water system only. In the 1960’s when Intalco Aluminum Corporation (now ALCOA) was considering building a facility at Cherry Point; they asked the PUD to go into the water business. The PUD did so and built a facility to supply water to Intalco. An additional facility was built in 1971 when ARCO (now BP Cherry Point) requested water service to a refinery they were proposing to build at Cherry Point. These facilities, along with some additional acquisitions have expanded the PUD to now serve water to the Cherry Point industrial customers and some 50 seasonal irrigation customers. American Waterworks Association (AWWA) is the authoritative resource on safe water, providing knowledge, information and advocacy to improve the quality and supply of water in North America and beyond. AWWA is an international nonprofit and educational society and the largest and oldest organization of water professionals in the world. Northwest River Partners is an alliance of farmers, utilities, ports and businesses that promote the economic and environmental benefits of the Columbia and Snake Rivers and salmon recovery policies based on sound science. Washington Water Utility Council (WWUC) represents Washington in the Pacific Northwest Section of the American Waterworks Association. The Council monitors legislation as it affects water utilities in Washington and keeps its members informed. Washington Water Supply Advisory Council (WSAC) provides advice and recommendations to the Department of Health (DOH) to ensure the people in the state of Washington have safe and reliable drinking water supplies. The 2016 updated of Whatcom County’s Coordinated Water System Plan Update is complete. For more information on this update please contact the Whatcom County Planning and Development Services at 360-778-5900. To view the Coordinated Water System Map of the various water utility providers, click on the above link to the plan and scroll to page 60. Note the file is large and takes a few minutes to download. On January 19, 2018 Governor Inslee signed ESSB 6091 which became effective immediately. The new state law addresses the use of permit exempt water withdrawals for development purposes. On Tuesday January 30, 2018 the Whatcom County Council passed Emergency Interim Ordinance 2018-001 enacting the provisions of ESSB 6091 for the Nooksack River Basin (WRIA 1) portions of the county. This Emergency Ordinance will allow citizens to obtain building permits with a new permit exempt well as their approved water source for domestic use (in most areas of the county) subject to certain conditions. For more information click on this link or contact the Whatcom County Health Department at 360-778-6000 for approved water availability.